It’s time to fertilise your indoor plants. Milton Wearing came in to see me this week. Milton is the President of The Ingleburn Horticultural Society and Garden Club. It’s a huge name!!!! They meet, on the second Wednesday of the month, at The Baptist Church Hall in Ingleburn. Milton tells me, it’s the oldest running garden club in Australia. He jokingly tells me he’s the youngest in the club. He’s lived here for 55 years. Milton has a famous daughter. Mandy Perrin was the editor of The Macarthur Chronicle for 30 years. He’s here, to hit me up, for a donation to use as a raffle prize. They are having their Autumn Show at the Community Hall in Oxford Street Ingleburn on Saturday the 30th of March. They have joined with The Macarthur Rose Society with this show. I’ve been donating a raffle prize for 35 years. I’m a push over. He’s leaving brochures on our counter to tell people about the show. He thinks our customers might be interested. I’ve been to the show, it’s a step back in time. Flowers in bottles and pot plants galore. There’s veggies too and roses of course. One of our customers fell in love with the Cliff Richard Rose last year. She’s been dreaming about Cliff ever since. The members take the show very seriously. You wouldn’t want to be a judge. First prize is as much as $5.00! He hits me up for a free gardening talk in September too. You can’t say no to Milton. Have you ever been to the Sydney University, Camden Campus? Lots of educated people go here. Educated people know that if you plant trees you’ll have better mental health, and a lovely shady place to eat your lunch. This University is just up the road from my place. It makes me feel better, just driving past these beautiful trees and gardens. It’s all native, but they have chosen trees with lush green foliage. Natives don’t have to be grey! Even during a drought, this University looks like an Oasis. Your garden could look like this. So could your suburb and your local park. Our Councils don’t seem to be interested in planting trees. If we have more trees it will be cooler and it will rain more often. Council elections are coming up. I haven’t read where one councillor is going to plant more trees. I think it’s time we voted this lot out. What do you think? It might be hot and sweaty out in the garden, but we can still have you smelling like a rose. We now stock Tilley’s Soap. This famous soap, has been made in Australia for 157 years! My favourite is the Lemon Myrtle. I even wash my hair with it. This soap is made using the oil from the Australian Native, Lemon Myrtle tree. They have discovered that this natural oil is anti fungal and antiseptic. If you’ve got Tinea, this Soap might help. The Lemon Grass Soap smells amazing too. There’s Goats Milk Soap for those with allergies. It’s cheap. 4 bars for $10.00. Bring your nose down for a treat. It’s made our shop smell divine. What’s the best Fertiliser for your indoor plants? 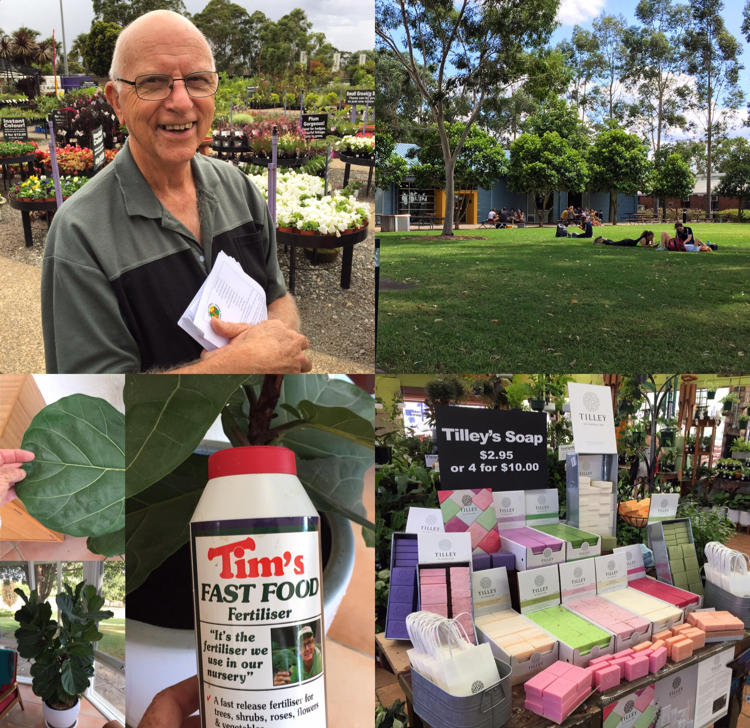 I fertilise my Fiddle Leaf Figs with Tim’s FAST FOOD. This fast release Fertiliser makes the leaves grow enormous, and they go bright green. I fertilise in spring and autumn to keep my plants healthy. It’s autumn today so it’s time to fertilise your indoor plants too. Tim’s FAST FOOD costs just $17.99. It’s safe for all your indoor and outdoor potted plants. Flowers and veggies love it too. Sprinkle Tim’s FAST FOOD around the base of your plants, then water well. You will see results within 14 days. You’re plants will love it. We are celebrating Garden Releaf on Sunday the 24th of March. Scientists have discovered, that if you spend time in your garden, it will give you better mental health. As gardeners, we already knew this, when we spend the day in the garden it makes us feel tired but great! We have guest speakers coming to help us have even more fun in the garden. 9am Learn how to grow Winter Vegetables. 10am Angie Thomas from Yates will be talking about “Growing Indoor Plants”. Angie is so famous she’s written a book about growing indoor plants and it’s a top seller. You can win her book if you turn up. Learn how to farm Bees in your backyard. Queen Bee Caroline will be talking about how she keeps bees in her garden. She’s a member of Macarthur Bee Keepers. You might get to eat some honey. 12 noon. Campbelltown Bonsai Society will have a Bonsai Display. Jim will tell you how to grow these beautiful potted plants. Bring your Bonsai down, if it needs repotting. Club members will repot it, for a $10 donation to Beyondblue. We will have a raffle prize. And you can bid on Blue Pig on EBay.